Lakes National Park as all of its peaks, streams and valleys. Founded in 1904 by the Western Coal and Oil Company based out of Vancouver, BC, according to the 2011 census Waterton Park Township has 88 permanent residents in 31 of its 181 dwellings. 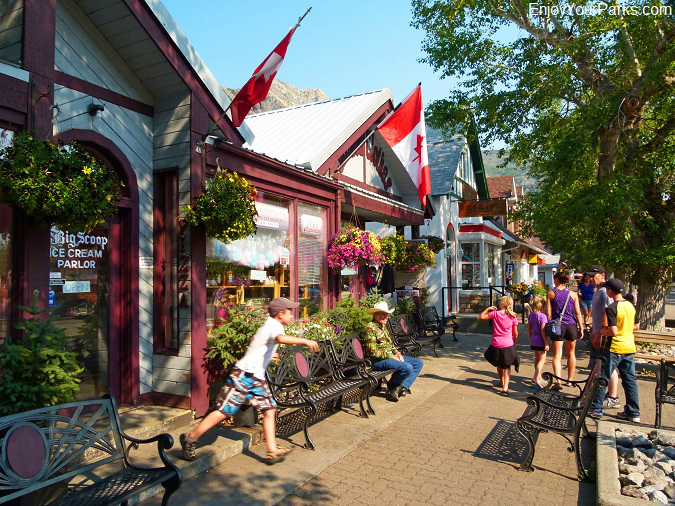 Though Waterton Park Township (Waterton Village) is not very big in acreage, it's jam-packed with wonderful gift shops, restaurants, hotels, motels, cabins, sporting goods and outdoor gear/clothing, bicycle rentals, boat rentals, boat tours, camping and much, much more. We absolutely love spending time in Waterton Park Township while visiting Waterton Lakes National Park, and we are confident you'll find this wonderful hamlet as wonderful and enjoyable as we do. The purpose of this page is to give you a glimpse of what Waterton Park Township (Waterton Village) has to offer, and hopefully we'll capture the "flavor" of Waterton Park Township along the way. The main street of Waterton Park Townsite reminds us of Disneyland's "Main Street U.S.A."
lined with shade trees on both sides, and everything is perfectly maintained and sparkling clean. The buildings are adorable, and the whole scene reminds us of Disneyland's "Main Street U.S.A".... And if we had only one word to describe this story book mainstreet, that word would be "charming". There's nothing more perfect than after a day of hiking and exploring the trails and parkways of Waterton Lakes National Park, heading to Waterton Park Township's main street and enjoying the evening. Having a great meal, walking the streets and checking out the gift shops. 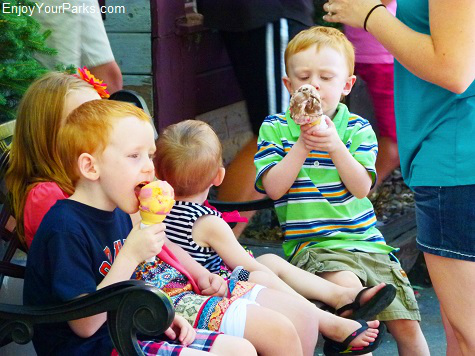 And you absolutely MUST have some of the best ice cream in North America (we're not kidding). 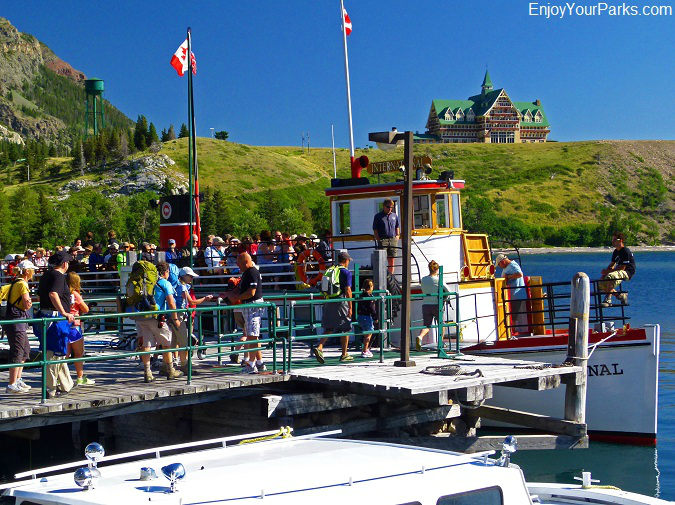 The Waterton Park Marina is home to the ever-popular Waterton Lake Boat Tours. well-kept marina and boat dock is where the historic wooden boat "International", and the modern boat "Miss Waterton" takes visitors on a fantastic tour of Upper Waterton Lake. This fascinating and scenic boat tour includes a half hour stop at Goat Haunt, which is located in Glacier National Park, Montana. 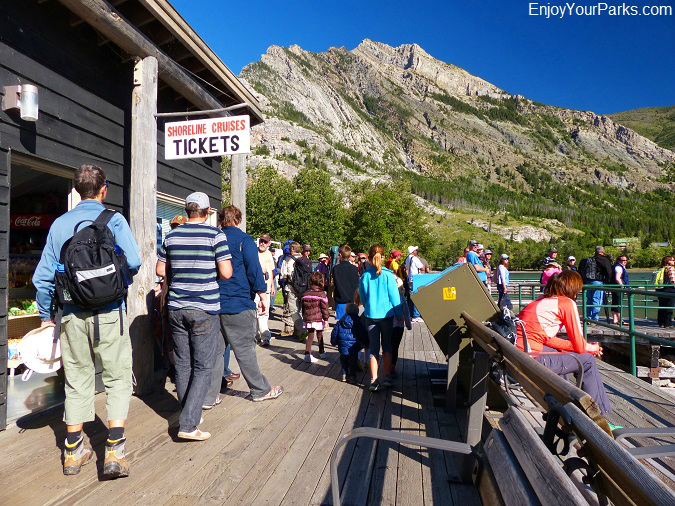 The Waterton Lake Boat Tour is without a doubt one of the most popular activities in Waterton Lakes National Park, and we highly recommend it. The boat dock and tour boat system connects the remote Northern Wilderness of Glacier National Park with Waterton Lakes National Park, and vice versa. Backpackers who started in Glacier Park and hiked through the northern wilderness inevitably end up at Goat Haunt, Montana. From there these hikers will take the tour boat from Goat Haunt on the 8 miles boat ride into Waterton Park Township. From there they will catch a shuttle back to Glacier National Park. Visitors preparing for the Waterton Boat Tour on board the historic wooden boat "International" in Waterton Park Township of Waterton Lakes National Park. 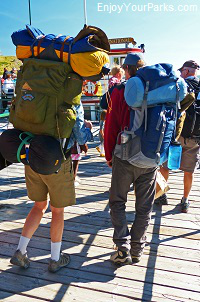 And conversely, hikers who are entering Goat Haunt from the Waterton side must take a tour boat to Goat Haunt to begin their Glacier National Park adventure into the northern wilderness. 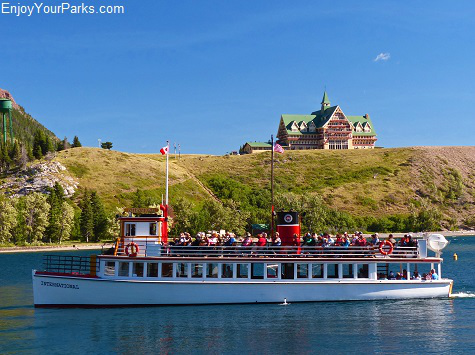 Therefore, these tour boats are not only one of the most popular activities in Waterton Lakes National Park, but they also are the "connection" between Glacier National Park and Waterton Lakes National Park. Click Here for more information on the Waterton Lake Boat Tour. 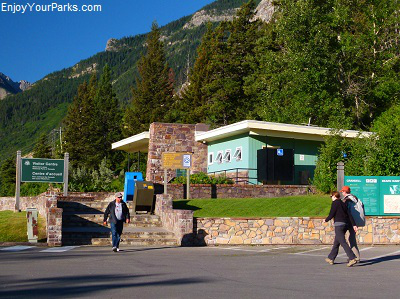 Another popular boat ride that starts at the Waterton Park Boat Dock is the boat shuttle to the Crypt Lake trailhead. 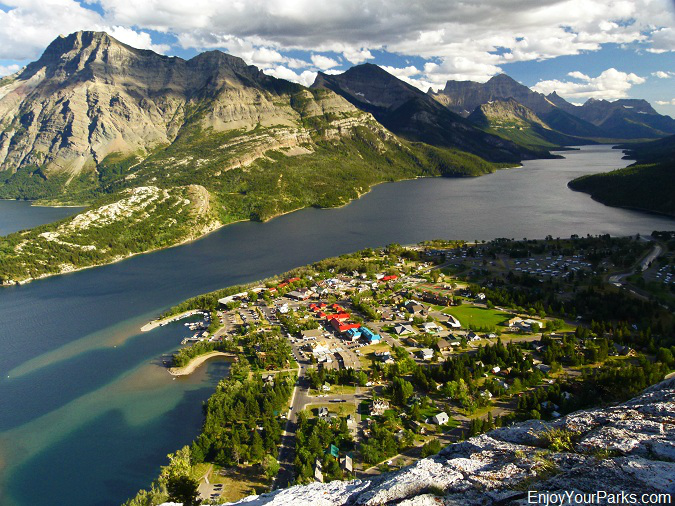 This 15 minute boat ride takes you to one of the most popular hikes in Waterton Lakes National Park. Click Here for more information on the hike to Crypt Lake. All along the east side of Waterton Park Townsite (Waterton Village) is a wonderful rocky shoreline of Upper Waterton Lake. This enjoyable beach is fun to walk along as you take in the beauty of your surroundings. Vimy Peak dominates the eastern skyline, and to the north you will see the historic Prince of Wales Hotel perched proudly on a grassy bluff. And while enjoying this shoreline, it's always an added treat when the historic wooden boat "International" cruises by on its way to or from it's boat tour to Goat Haunt in Glacier National Park, Montana. The Waterton Lake Shoreline is a very popular place to hang out while visiting Waterton Park Townsite in Waterton Lakes National Park. The large peak in the photo is Vimy Peak. There is also a very nice cement walk-way that you can walk along the shoreline. This walk-way takes you all the way to the southern end of Waterton Township, and this is where you will get a great view of the majestic Mount Cleveland to the south. This towering giant is the tallest peak in Glacier National Park, Montana, and it looms directly above Goat Haunt (see photo below). 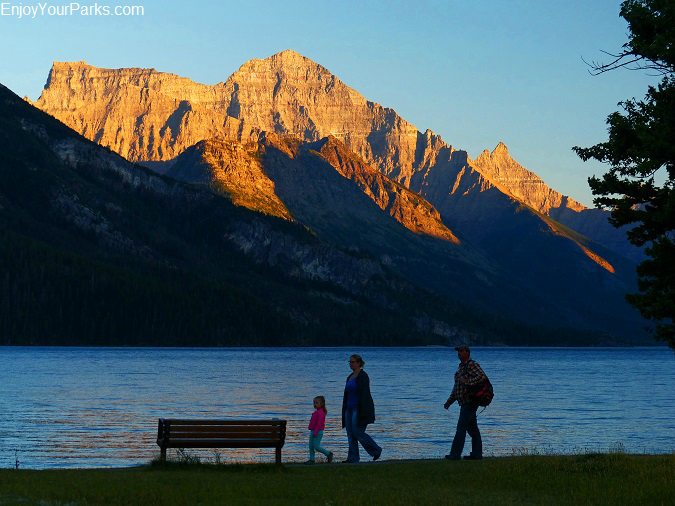 Visitors enjoying an evening walk along the Waterton Lake shoreline walkway. Mount Cleveland of Glacier National Park glows in the background. At the north end of Waterton Park Townsite, and just below the Prince of Wales Hotel, is Emerald Bay. 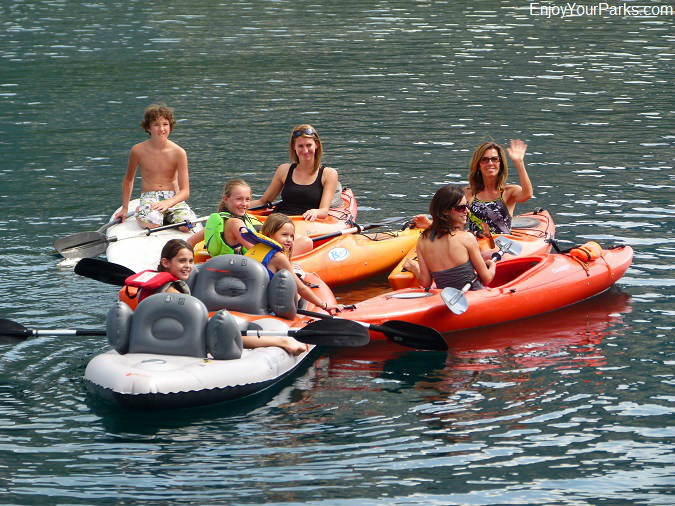 Emerald Bay is a very popular place for visitors to enjoy kayaking, boating, canoeing, and swimming. The water is a little warmer than the rest of the lake, and a lot more calm. 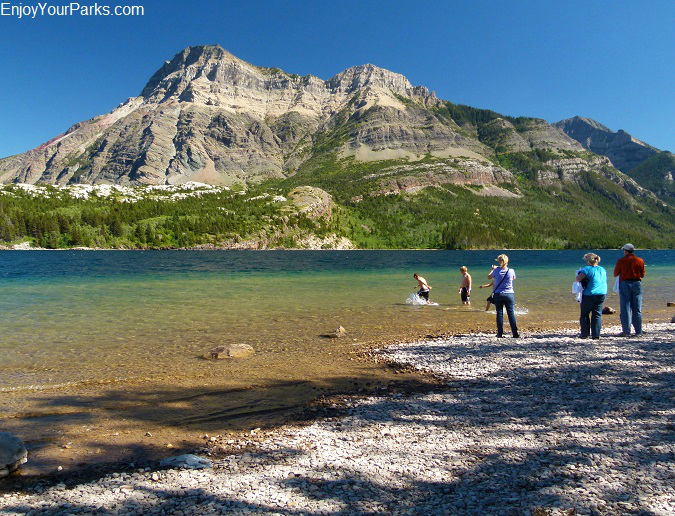 Emerald Bay is a great place to enjoy the water of Upper Waterton Lake in Waterton Lake National Park. (the other two are Crandell Mountain Campground and Belly River Campground). 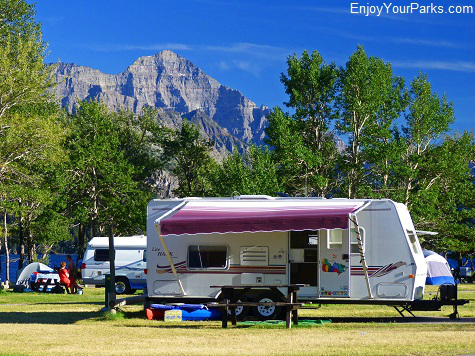 The Wateron Park Townsite campground is extremely popular and provides outstanding views of Upper Waterton Lake and the surrounding mountains such as Mount Cleveland of Glacier National Park. Now we must at least mention that Waterton Park Townsite gets its share of wind on occasion, so keep this in mind. Usually during the summer, you'll get far more calm days than windy days, but when the wind does decide to blow, it's pretty amazing. However, to help deal with the wind, the Waterton Park Townsite Campground has buildings built for cooking and building fires in fireplaces throughout the campground. 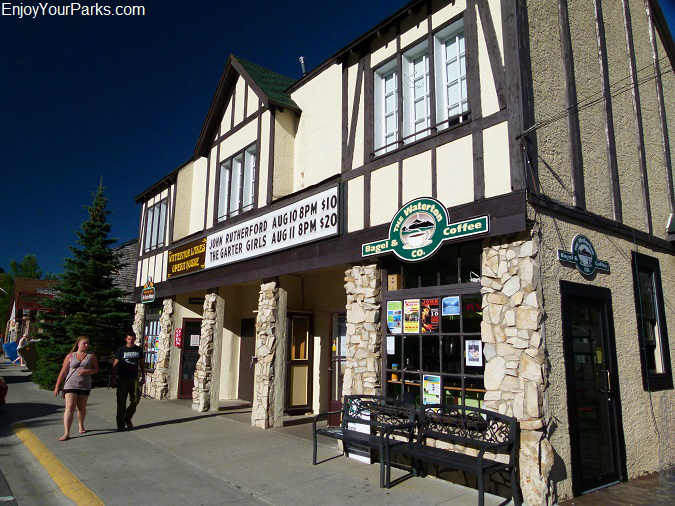 Just before you enter the Waterton Park Townsite (Waterton Village), you will encounter the Waterton Lakes National Park Visitor Center to your right. This visitor center is an extremely valuable place for information regarding all of the hikes, campgrounds and activities within Waterton Lakes National Park. The ranger staff at the Waterton Lakes National Park Visitor Center are always very nice and willing to answer all of your questions about this amazing park. 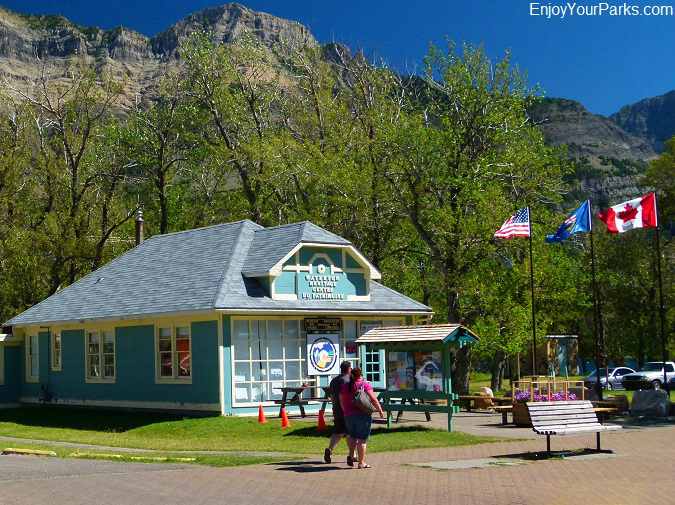 And for those of you who are planning to embark on any multi-day hiking adventures, whether this be in Waterton Lakes National Park or Glacier National Park, this visitor center is where you go to get your backcountry permits and campsite reservations. 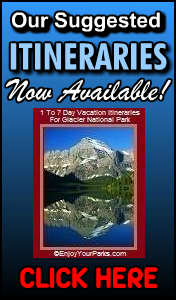 And what is so very nice is that they are connected to Glacier Park's backcountry reservation system, so the process for registering backcountry permits and campsites between these two national parks is seamless. A view of Waterton Park Townsite from The Bear's Hump in Waterton Lakes National Park. Click Here for more information on the hike to The Bear's Hump. 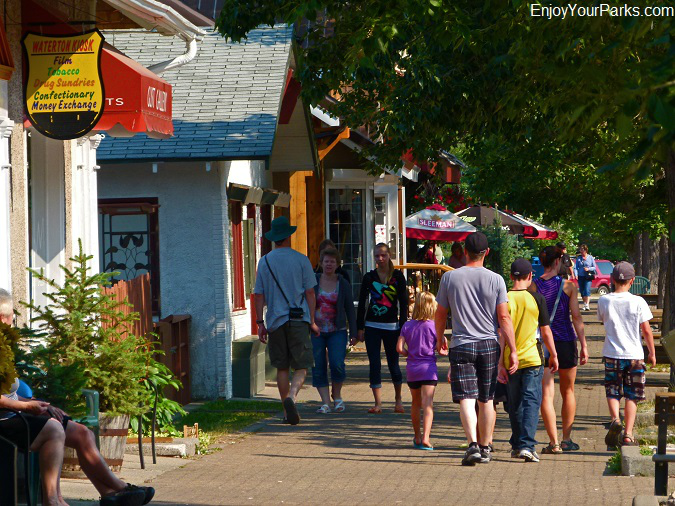 Visitors walking along the main street of Waterton Park Townsite in Waterton Lakes National Park. 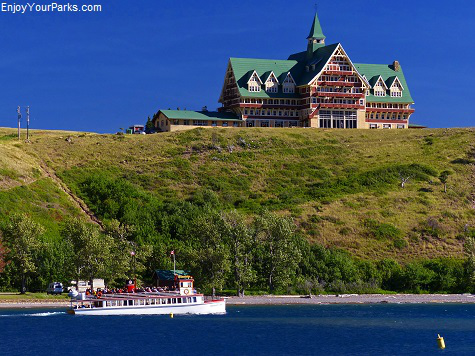 The historic Prince of Wales Hotel overlooks the Waterton Valley and Waterton Park Townsite, and is an iconic image of Waterton Lakes National Park. No matter where you are in Waterton Park Townsite, you can always look to the north and see the Prince of Wales Hotel overlooking the townsite. Located across the road from the visitor center, we highly recommend that you spend some time enjoying this famous icon of Waterton Lakes National Park. Click Here for more information on the historic Prince of Wales Hotel. The Waterton Heritage Centre is located on Waterton Park Townsite's mainstreet, and is a great source of interesting information about this remarkable area. There is a museum and bookstore on the premises. information about the Waterton area. There is a wonderful museum and bookstore on the premises. The Waterton Heritage Center is really a great resource to learn about this incredible area, and we highly recommend it. While spending time in Waterton Park Townsite, you can't help but notice "quadracycles" on the roads throughout this charming townsite. 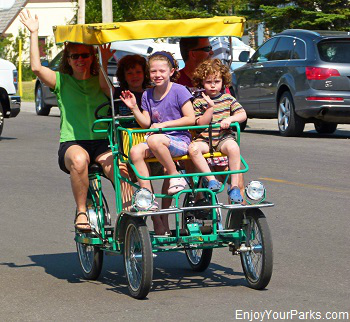 These quadracycles are an iconic image of Waterton Park Townsite, and are really popular with park visitors. 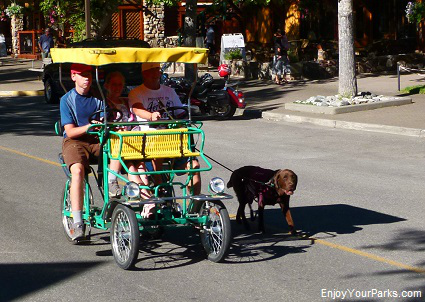 Waterton Park Townsite wouldn't be the same without having visitors riding around the town on these quadracycles. You can also rent mountain bikes and scooters to ride around town as well. 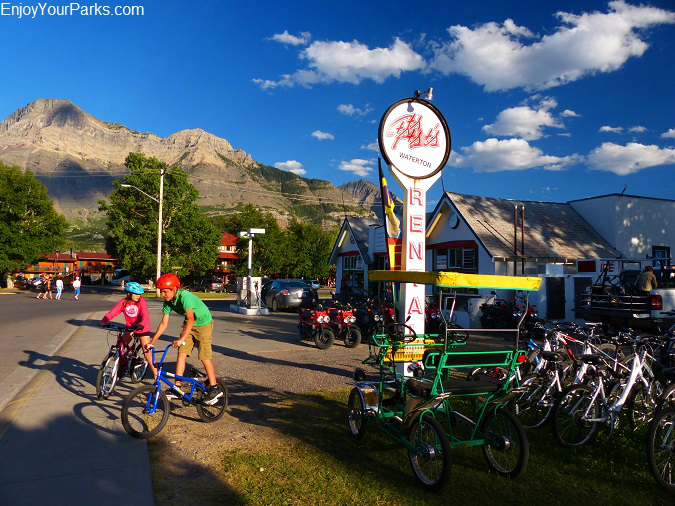 Whether you'd like to try a quadracycle, scooter or mountain bike, you can rent them at Waterton Park Township in Waterton Lakes National Park. Don't be shocked when you see mule deer wandering the streets of Waterton Park Townsite. They actually live here as iconic residents of this wonderful little town. Just don't approach them because they are still wild animals and are very unpredictable. 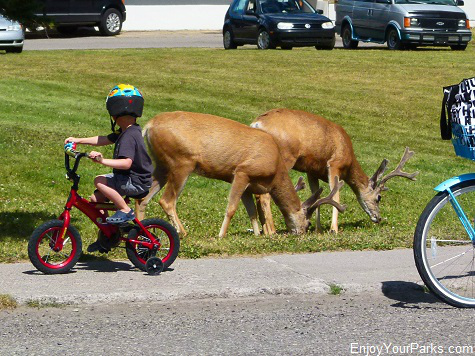 Just like with quadracycles, Waterton Park Township wouldn't be the same without mule deer running around the streets and yards! Another iconic image of Waterton Lakes National Park is Cameron Falls. 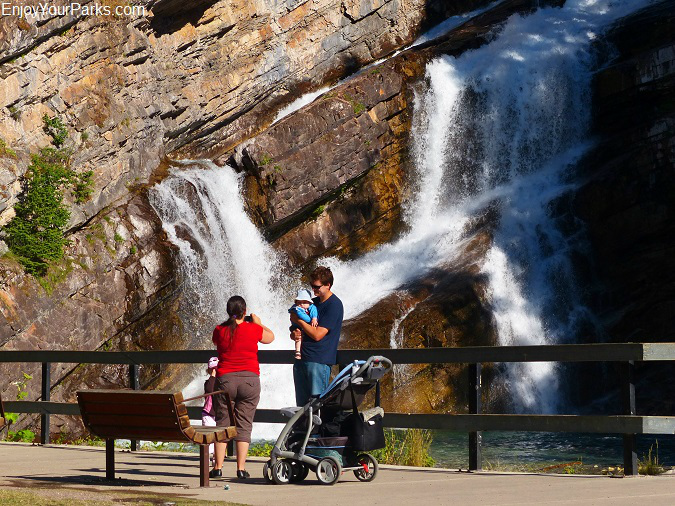 These gorgeous falls are located right in town, and are a "must see" while spending time at Waterton Park Townsite. Water coming down Carthew Creek cascades down some of the oldest rock in North America known as "Precambrian" rock. Located in the southwest corner of Waterton Village, you will be glad you took the time to see the amazing Cameron Falls. Cameron Falls is located in Waterton Park Townsite, and is a "must see" while visiting this incredible little town in Waterton Lakes National Park. 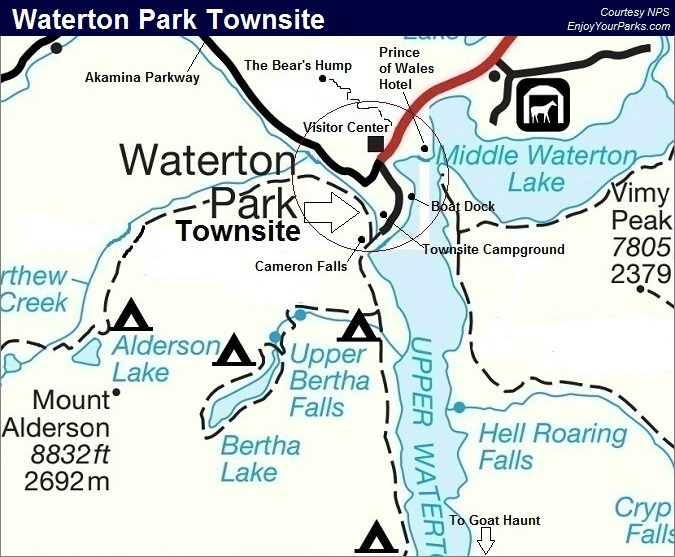 Waterton Park Townsite, a.k.a. 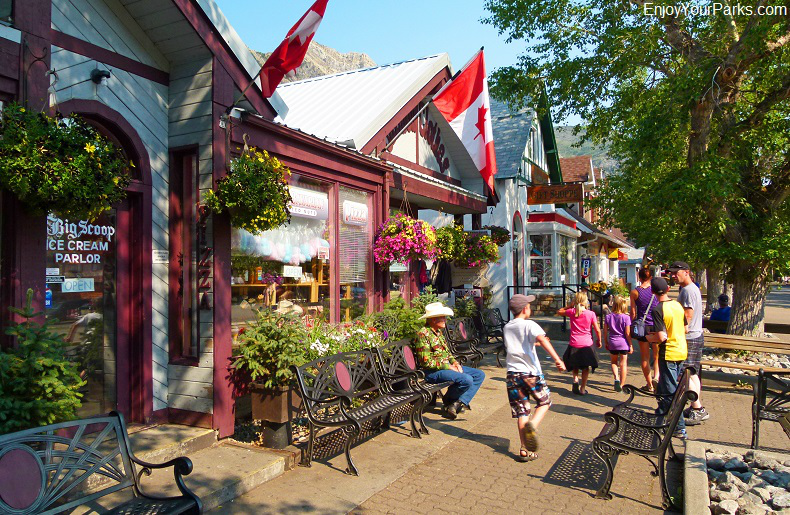 Waterton Village, is a wonderful place to visit during your Waterton Lakes National Park vacation.